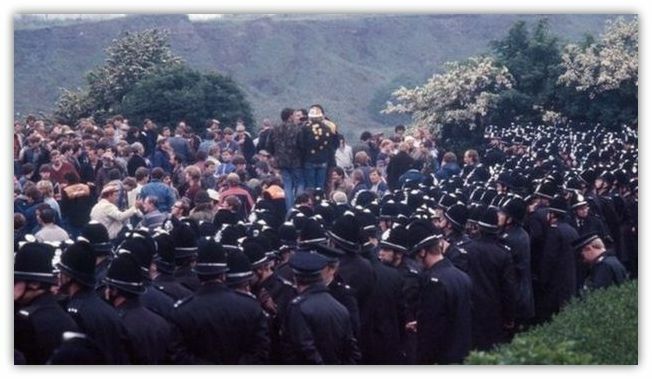 Police will not be investigated over one of the most violent clashes of the 1984-5 miners' strike, the Independent Police Complaints Commission has ruled. The passage of time meant allegations of assault and misconduct at Orgreave coking plant in South Yorkshire "could not be pursued", the watchdog said. About 10,000 strikers and 5,000 police were involved in what became known as the "Battle of Orgreave", in June 1984. Campaigners said they were disappointed and have called for a public inquiry. South Yorkshire's Police and Crime Commissioner Alan Billings described the decision as a missed opportunity that did "disservice" to former miners, police and the Independent Police Complaints Commission (IPCC). The IPCC said its decision could be reviewed if further evidence emerged. South Yorkshire Police referred itself to the IPCC after a BBC documentary in 2012 claimed officers may have colluded in writing court statements. The force also faced claims officers had used "excessive force" and gave false evidence in court. IPCC deputy chair Sarah Green said: "These are events from more than 30 years ago, and I have considered the impact such a passage of time could have on an IPCC investigation and possible outcomes. 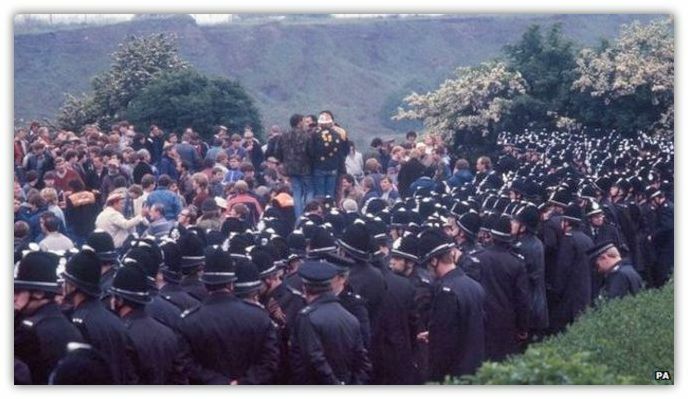 and 93 people were arrested in the so-called "Battle of Orgreave"
"In addition, because the miners arrested at Orgreave were acquitted or no evidence offered, there are no miscarriages of justice due to alleged police failures for the IPCC to investigate. "Allegations of offences amounting to minor assaults could not be prosecuted due to the passage of time; and as many of the police officers involved in events at Orgreave are retired, no disciplinary action could be pursued." Mark Metcalf, spokesman for the Orgreave Truth and Justice Campaign (OTJC), said its members were disappointed by the decision, but not surprised. He said: "The fact the IPCC, described rightly in our view by many prominent individuals as 'not fit for purpose', is stepping aside will not deter the OTJC from continuing its campaign. "The IPPC report recognises the limitations of what the organisation can do and that only a Hillsborough-style public inquiry can eventually get to the truth." Chris Kitchen, general secretary of the National Union of Mineworkers (NUM), said the union wanted justice: "We want it to come to light what happened so that people can move on and can look to the future." Former miner Kevin Horne, 64, who was arrested for obstruction, but never charged, said: "I think they've got away with murder really, because the evidence is all there." TUC General Secretary Frances O'Grady described the decision as a "hammer blow" for former miners and their families and echoed calls for a public inquiry. Labour shadow home secretary Yvette Cooper, who backed calls for a public inquiry, said: "This decision lets down the Orgreave families and shows the weakness of the current system. 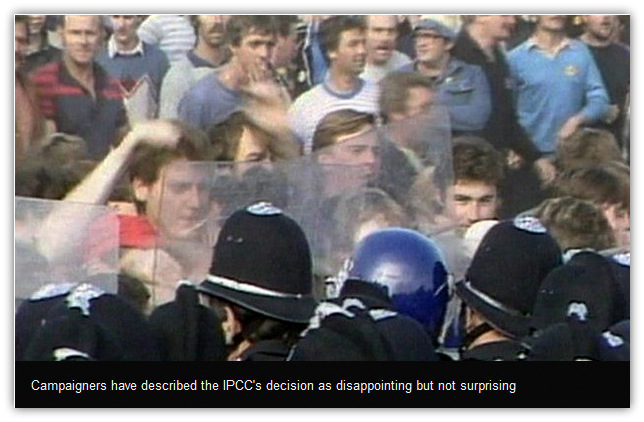 "It has taken the IPCC two-and-a-half years to decide not to investigate the events at Orgreave and to conclude that the big questions weren't within their remit or resources. "If they are too limited to do the job then someone else needs to." What was the 'Battle of Orgreave'? 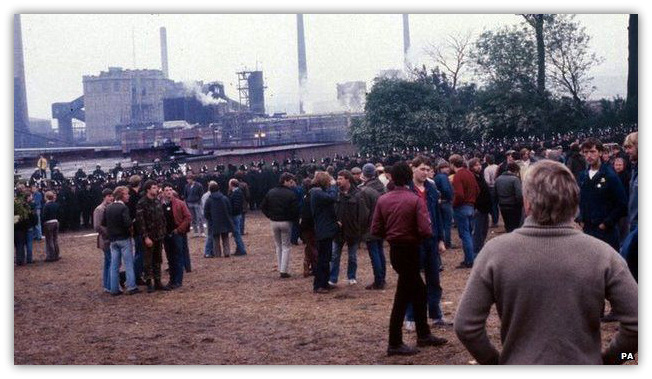 On 18 June 1984 about 10,000 striking miners gathered at Orgreave coking plant near Rotherham determined to stop several lorry loads of coke leaving for the steelworks. About 5,000 police officers, drafted in from across the country, stood against them, to hold them back. There was violence on both sides, but when police horses charged the crowd the violence escalated and many officers and miners were injured. Those arrested at Orgreave were held for a variety of alleged offences, with several being put on trial for rioting. The trial collapsed after 16 weeks when it became clear police evidence was unreliable. The events at Orgreave have spawned several films and television programmes, including a re-enactment staged for the 2001 documentary "The Battle of Orgreave", and artworks and songs, such as Dire Straits' "Iron Hand". 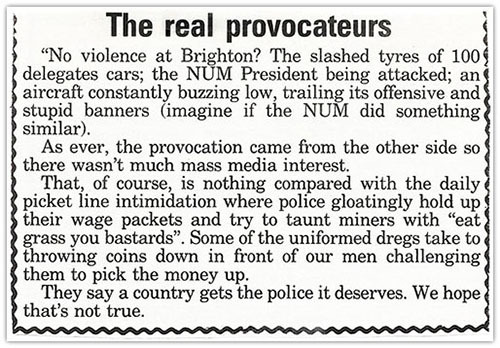 Dave Smith, a former miner and former president of Dinnington NUM was at Orgreave on 18 June 1984. He said it was a hot day and they had been playing football, but the police arrived and all "hell let loose." "Horses came out, short shields came out; we tried to defend ourselves as best we could. "Most of us were running like hell. We finished up down embankments, on to railway lines with dogs chasing us. "People were seriously injured and I mean seriously injured, and left by the police. "That's not helping, that's attacking, and we were attacked." The watchdog's decision follows a two-year "scoping exercise" during which thousands of documents, film and photographs were analysed. Ms Green said she accepted there were "concerns about some of the actions of individual officers" but said it was difficult to go back and apply current thinking and standards to the events at Orgreave. "If this happened now, absolutely the IPCC would be investigating it," she said. "But what we can't do is wind back time to go back 30 years and redo what perhaps should have been done then." Chief Constable of South Yorkshire Police David Crompton said: "I note the outcome of the in-depth review conducted by the IPCC which concludes that due to both the evidential and public interest considerations in this case there is no requirement for further investigation into these matters." Campaigners calling for a public inquiry into the 1984 Battle of Orgreave disorder have been told a decision will be made by the end of October. 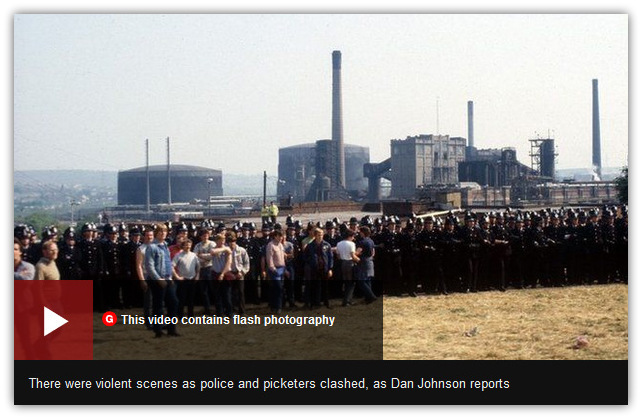 Thousands of miners and police clashed at the South Yorkshire coking site. Campaigners met with Home Secretary Amber Rudd to renew calls for a probe into police handling of the event. It comes after an ex-PC told Channel 4 officers were told to write statements for arrests they had not made. He said: "I knew in my own mind that was wrong." 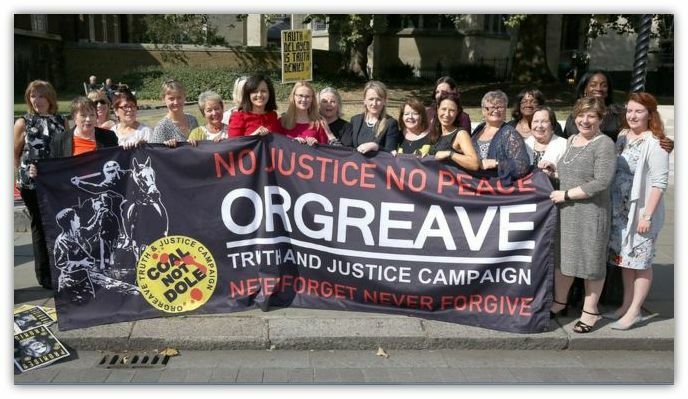 A delegation from the Orgreave Truth and Justice Campaign (OTJC), which met with the Home Secretary, said they were feeling "positive" after the meeting. The so-called Battle of Orgreave saw miners attempt to stop lorry loads of coke leaving for the steel works, with police holding them back. 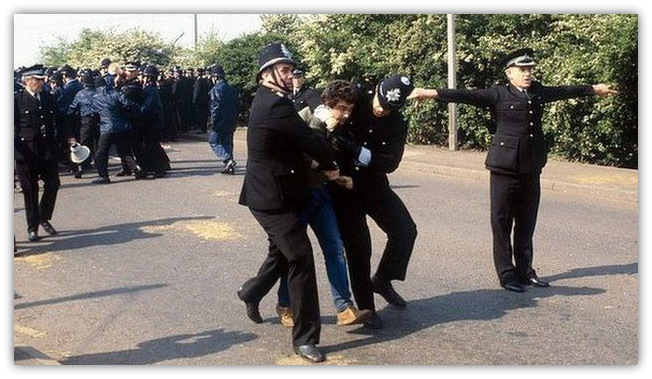 About 6,000 officers are alleged to have used excessive force to suppress the miners' strike at the plant. Shadow home secretary Andy Burnham, who was also in attendance, said it was an "encouraging meeting" and he hopes a decision will be made to "shine a spotlight on our country's past". Former miner Kevin Horne said: "I think we have reached another milestone. There's still a way to go, but we're getting there." Earlier, Labour leader Jeremy Corbyn and other MPs gathered for a demonstration outside Parliament to lend their support. 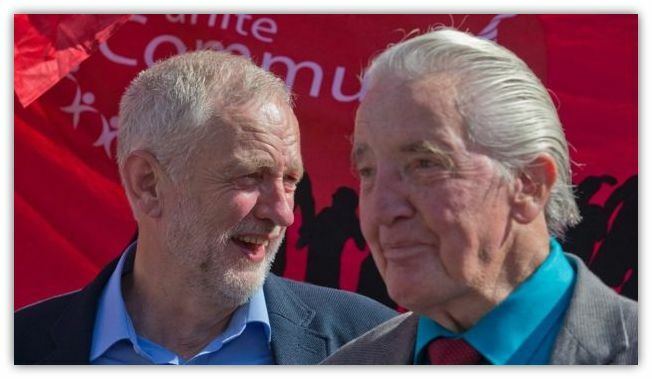 Veteran Labour MP Dennis Skinner, who was at Orgreave, said: "The police at Orgreave were called upon to write the same thing over and over again about every single miner they arrested." A total of 95 miners were charged following the clashes but their trial collapsed.